These questions will be answered in this series of articles on aircraft hardware. I hope to eliminate some confusion over what type of hardware to use and how to properly install it. To begin our discussion, it is absolutely imperative that you use nothing but aircraft grade hardware. Commercial grade hardware found in hardware or automotive stores is legal to use on an experimental airplane but should not be considered for even a moment. Why? Let’s look at bolts as an example. Common steel bolts purchased from a hardware store are made of low carbon steel that has a low tensile strength usually in the neighborhood of 50,000 to 60,000 psi. They also bend easily and have little corrosion protection. In contrast, aircraft bolts are made from corrosion resistant steel and are heat treated to a strength in excess of 125,000 psi. The same comparison applies to most hardware items. So, use only aircraft quality hardware on your airplane. Save the other hardware for your tractor. 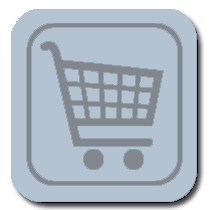 – Miscellaneous items such as 0-rings, crush washers, etc. Where do you find information concerning aircraft hardware? Your aircraft plans or assembly manual should provide you with a general overview of hardware used on your project. Use the hardware the aircraft designer or kit manufacturer recommends. Do not substitute with your own ideas. This can be dangerous. The manufacturer has tested the design and its safety is dependent upon the proper pieces of hardware. FAA Advisory Circular 43-13-IA is an excellent reference source. The Airframe Mechanics General Handbook also has a very good section on the selection and use of hardware. These two books are considered the primary authority on the proper use of hardware. In addition, I would recommend two other small reference books: the Standard Aircraft Handbook and the Aviation Mechanic Handbook. Both of these provide a good reference source. The Aircraft Spruce & Specialty catalog also contains good reference material on hardware. If you have any doubts about the quality of the aircraft hardware you are purchasing, request a copy of the manufacturer’s specifications. These specifications along with a specific manufacturer’s lot number should be available. Bolts are used in aircraft construction in areas where high strength is needed. Where this strength is not necessary screws are substituted. Aircraft quality bolts are made from alloy steel, stainless or corrosion resistant steel, aluminum alloys and titanium. Within our industry the first two are the most common. Aircraft bolts will always have a marking on their head. If you see no markings at all on the head of a bolt, do not use it. It is probably a commercial grade bolt. The markings on bolts vary according to the manufacturer. You should see an “X” or an asterisk along with a name, etc. If you purchase a corrosion resistant (stainless steel) bolt, the head of that bolt should have one raised dash. An aluminum bolt will have two raised dashes on its head. Aluminum bolts have limited use. They should not be used in tension applications or where they will be continuously removed for maintenance or inspection. 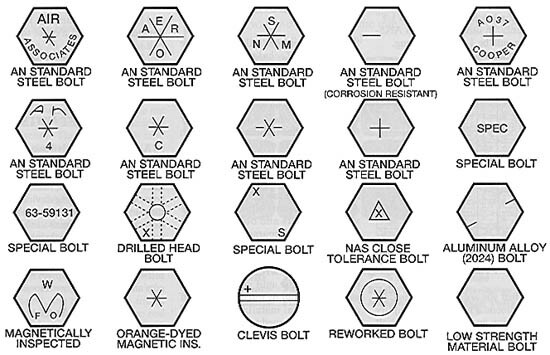 A chart of typical bolt heads is presented in Figure 1. NAS bolts have a higher tensile strength (usually about 160,000 psi) and can be identified by a cupped out head. Close tolerance bolts are machined more accurately than general purpose bolts and they are used in applications requiring a very tight fit. Close tolerance bolts can be either AN or NAS and typically have a head marking consisting of a raised or recessed triangle. – AN means the bolt is manufactured according to Air Force-Navy specs. So, this particular bolt is a 1/4 inch diameter AN bolt that is 1/2 inch long measured from just under the head to the tip of the shank. The bolt also has an undrilled shank which means it cannot accept a cotter pin. Also, bolt length may vary by +1/32″ to -1/64″. If the letter “C” follows the AN designation (ANC) that identifies a stainless steel bolt. The letter “H” after AN (ANH) identifies a drilled head bolt. In constructing you airplane, you will not encounter many bolts larger than an AN8 (1/2 inch diameter). To add a bit more confusion, if the dash number defining the length of the bolt has two digits, the first digit is the length in whole inches and the second number the length in additional 1/8″ increments. In other words, an AN514 bolt would be I- 1/2 inches long. It is important that you do not “over tighten” or “under tighten” a bolt or the nut attached to a bolt. Under torque or under tightening results in excessive wear of the hardware as well as the parts being held. Over tightening may cause too much stress on the bolt or nut. The best way to avoid this is to use a torque wrench. AC43-13 presents a table of torque values for nuts and bolts. It shows fine thread and coarse thread series with a minimum and maximum torque limit in inch pounds. I recommend using a torque wrench whenever possible, at least until you get an idea as to the amount of force required. Of course, critical installations should definitely be torqued to proper values. A torque wrench is not that expensive and will be a worthwhile investment for a custom builder. 1 – In determining proper bolt length – no more than one thread should be hidden inside the bolt hole. 2 – Whenever possible, bolts should be installed pointing aft and to the center of an airplane. 3 – Use a torque wrench whenever possible and determine torque values based on the size of bolt. 4 – Be sure bolt and nut threads are clean and dry. 5 – Use smooth, even pulls when tightening. 6 – Tighten the nut first – whenever possible. 7 – A typical installation includes a bolt, one washer and a nut. 8 – If the bolt is too long, a maximum of three washers may be used. 9 – If more than three threads are protruding from the nut, the bolt may be too long and could be bottoming out on the shank. 10 – Use undrilled bolts with fiber lock nuts. If you use a drilled bolt and fiber nut combination, be sure no burrs exist on the drilled hole that will cut the fiber. 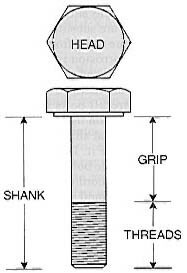 11 – If the bolt does not fit snugly consider the use of a close tolerance bolt. 12 – Don’t make a practice of cutting off a bolt that is too long to fit a hole. That can often weaken the bolt and allow corrosion in the area that is cut. AN310 and AN320 castle nuts are the most commonly used (see Figure 4). Castle nuts are fabricated from steel and are cadmium plated. Corrosion resistant castle nuts are also manufactured (AN310C and AC320C – remember, when you encounter a “C” it will designate stainless). Castle nuts are used with drilled shank bolts, clevis bolts and eye bolts. The slots in the nut accommodate a cotter pin for safetying purposes. The thinner AN320 castellated shear nut has half the tensile strength of the AN310 and is used with clevis bolts which are subject to shear stress only. The dash number following the AN310 or AN320 indicates the size bolt that the nut fits. In other words, an AN310-4 would fit a 1/4 inch bolt. 1 – When using a castle nut, the cotter pin hole may not line up with the slots on the nut. The Mechanics General Handbook states “except in cases of highly stressed engine parts, the nut may be over tightened to permit lining up the next slot with the cotter pin hole.” Common sense should prevail. Do not over tighten to an extreme, instead, remove the nut and use a different washer and then try to line the holes again. 2 – A fiber nut may be reused if you are unable to tighten by hand. 3 – At least one thread should be projecting past the fiber on a fiber nut installation. 4 – No self-locking nuts on moving part installations. 5 – Do not use AN364 or AN365 fiber nuts in areas of high temperature – above 250′ F.
6 – Shear nuts are to be used only in shear loads (not tension). 7 – Plain nuts require a locking device such as a lockwasher or a check nut. 8 – When using a lockwasher, place a plain washer between the surface of the airplane part and the lockwasher. 9 – Shear nuts and standard nuts have different torque values. 10 – Use wing nuts only where hand tightness is adequate. AN960 washers are the most common. They are manufactured in a regular thickness and a thinner thickness (one half the thickness of regular). The dash number following the AN960 indicates the size bolt for which they are used. The system is different from others we have encountered. As an example, an AN960-616 is used with a 3/8″ bolt. Yet another numbering system. If you see “L” after the dash number, that means it is a thin or “light” washer. An AN960C would be – yes, a stainless washer. I can tell you are getting more familiar with the system so I will throw another wrench into the equation – an AN970 washer has a totally different dash number system. I am not even going to tell you what it is. I will tell you that an AN970 is a larger area flat washer used mainly for wood applications. The wider surface area protects the wood. The cotter pins mostly used on custom aircraft are AN380 and AN381. Cadmium plated cotter pins are AN380 and stainless are AN381. Cotter pins are used for safetying bolts, screws, nuts and other pins. You will normally use them with castle nuts. The MS number you may see is MS24665. The dash numbers indicate diameter and length of the pin. As an example, AN380-2-2 would be a cadmium plated pin 1/16″ in diameter and 1/2″ long. All supply companies will have charts showing the various sizes versus the reference number. Safety wire is also widely used. The most used sizes in diameter are .020, .032 and .041 or small variations thereof. The material is usually stainless steel or brass. The easiest method of installation is acquired by using safety wire pliers (see Figure 6). The pliers are used to twist the wire. The wire is installed so that if the nut or bolt begins to loosen it will increase the tension on the wire. Be sure you do not overtwist the wire – doing so will weaken the safety wire. Leave about 36 twists and then cut off the excess wire and bend its end so you do not snag it with your hand at a later time. I want to emphasize the major point of this article. USE ONLY AIRCRAFT QUALITY HARDWARE. Do not assume the engineer role by using hardware types or sizes that are contrary to your plans or assembly manual. In future articles I will discuss the other hardware items including control cable installation, screws, rivets, turnlock fasteners, etc.